Attend our May edition of the SOA & BPM Partner Community Webcast live on April 23rd 2017 at 17:00 CET. Oracle DMN is one of the first DMN cloud-based services to come to market. In addition to adhering to the DMN standard and its cloud-based provisioning mechanism, users and developers can assemble decisions that are accessible anywhere and anytime. Come to this session to learn more about Oracle’s DMN service and its capabilities and how it can be easily leveraged within Oracle Process Cloud Service. Redstone is a Platinum level system integrator and value added reseller focusing on Oracle’s Digital Experience and Cloud solutions. ​~John Klein, Redstone Content Solutions, United States. Improved business process efficiency with the ability to create web content in Oracle Sites Cloud and storing in Oracle Documents Cloud. This enhancement has eliminated the risk of duplicate content and prevents incorrect data from being shared with the public via our website. Read the complete case study here. Choose a QuickStart App to quickly create an application and learn about Process Cloud Service. QuickStart Apps include all the implementation details needed to play and deploy them. 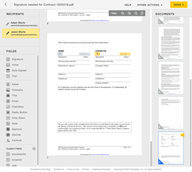 Use these applications as a ready-to-use application to deploy or as a starting point to adapt by making changes such as editing task titles, modifying the web form, or adding new task actions. Read the complete article here. Form-First: You can follow a "Form-First" approach where you create the form first before any data elements are defined and you let PCS by just drag and dropping components from the component palette to the page. Oracle PCS will automatically generate the schema that defines the data required by the web form. Form-First: You can follow a "Form-First" approach where you create the form first before any data elements are defined and you let PCS by just drag and dropping components from the component palette to the page. Read the complete article here. I have just published my first OTN Tech Article where I present a use case that demonstrates how Oracle Process Cloud Service (Oracle PCS), Oracle Mobile Cloud Service (Oracle MCS) and Oracle Mobile Application Framework (Oracle MAF) can be use together to expose an Oracle PCS process instance as a web service and consume it from an external system, web application or mobile application. "Oracle Process Cloud Service is a Platform as a Service (PaaS) provided by Oracle Cloud, allows you to rapidly design, automate, and manage business processes in the cloud." "Oracle Mobile Cloud Service is Oracle’s Mobile Backend as a Service (MBaaS) and enables companies to create and deploy scalable, robust, and secure mobile applications quickly and easily." "Oracle Mobile Application Framework is a hybrid mobile framework that provides a visual and declarative development experience for the rapid development of multi-platform applications" You can check the full article here. Lots of great new features, just in time for the Holiday Season. Thanks to my colleague Kathryn L.
I will be adding to this post over time, so, currently, it is not an exhaustive list. Note: the second icon on the right, under the docs icon. For those of you who have yet to meet a Quickstart Master – here’s a quick intro. I take an existing process and convert it to a Quickstart Master. Read the complete article here. 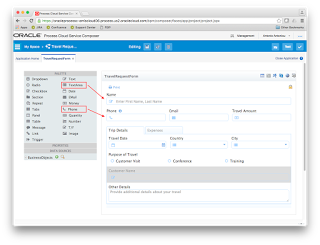 Want to try Process Cloud Service? Get access here. Learn about the new and changed features of Oracle Process Cloud Service. On the Workspace Tracking page, administrators can now click the Conversations icon in addition to the Documents icon and view conversations associated with a selected instance. On the Configure UI Customizations page, an option that lets you hide comments displayed on the Tasks page and Tracking page has been added. This option is valid only if you integrated Oracle Documents Cloud Service with Oracle Process Cloud Service, and you enabled conversations. On the Personalize page, the options for the Item field have been improved. · You can now customize the activities in a subprocess. · The list is now organized by swimlane followed by all the activities for that lane. If there is a subprocess, then the list expands to show all activities for the subprocess as well. An option to search the list has also been added. These new features make it easier to find the element you want to customize. 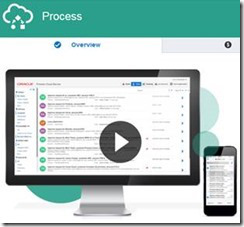 See Decide What Settings Users Can Customize in Using Oracle Process Cloud Service . · Reorganized the toolbar and grouped UI components into cookbook. · Added support for web forms in task details. · Added support for conversations. · Added the DevTool option, which lets you bring up the REST API in an interactive format so you can enter and test your code. Read the complete article here. More often than not, you will want your processes to interact with other services or processes inside or outside your enterprise. 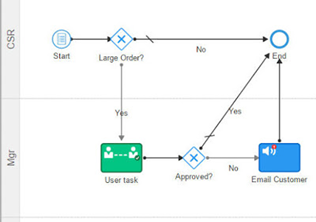 Since integration options are rather typical in Oracle Process Cloud Service, this article will help you to apply best practices for creating and managing your connections in a sustainable fashion. Let’s say you have modelled a process in Oracle Process Cloud Service (PCS) for a private home loan application. Chances are quite high that this process will need some extra information to make the right decisions, like a credit check or a risk assessment and you will want to store the result of the application somewhere, for example in a database. This requires several integration points in your PCS application. Now if you would directly import the WSDLs of those web services that you need to integrate with, it’s most likely not going to work. For example, Oracle Policy Automation, which you can use for risk assessment, has a highly generic interface and without XSLT support in PCS, you can’t make a proper request. Other services might require WS-Addressing or other technical aspects that PCS doesn’t support, so you need to put something in between. 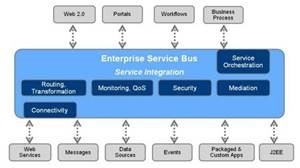 For this something, you can use various SOA and Service Bus products or Oracle’s Integration Cloud Service, once it has matured some more to deal with web services properly. So, you have decided to put one or more layers of services between PCS and the web services that you need to invoke. Regardless of your architecture, you need to keep some considerations in mind: Read the complete article here. In this series we will walk through different cloud products and how SaaS and PaaS can be combined together and their use in different projects. In this podcast we would like to introduce you to Oracle Process Cloud to a wider audience. Oracle Process Cloud is the part of Oracle PaaS Cloud and it focuses on delivering processes in Cloud. This episode features Leon Smiers, Solution Architect in Capgemini and Oracle ACE and Jeroen van Essen, Capgemini BPM Specialist. Listen to the podcast here.